A crowd protests the skyrocketed bread and fuel prices, among others, in El Gezira Aba in White Nile state, on December 21. 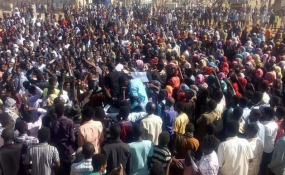 El Gezira — Sudan's President Omar Al Bashir has branded those participating in country-wide protests as 'traitors' during a short visit to Wad El Haddad in El Gezira state on Tuesday. The 15-minute visit was accompanied by high alert and tight security, as witnesses say "hundreds of military vehicles arrived in the state". In a public speech in El Gezira's Wad El Haddad, Al Bashir described the protestors as "rumour-makers, traitors, and foreign agents", pointing out that the authorities seek to pursue them. "Traitors and mercenaries have exploited the hardship of the living of people and sought sabotage," he said. He added that his presence in El Gezira was the best response to rumours that talk about his arrest and imprisonment. "A war is being waged against Sudan for its adherence to its religion and its pride. Sudan will not sell itself for wheat or Dollars." Residents of Wad El Haddad told Radio Dabanga that a very limited number of people participated in the welcoming Al Bashir in the town. They explained that the visit lasted for less than a quarter of an hour, for which the still uncompleted Wad El Haddad Stadium was opened. Callers said that most of the audience were basic school pupils and Koran students. Residents of Wad Madani, capital of El Gezira, told this station that the number of those who received the president at El Mawlid Square in the city did not exceed dozens, explaining that therefore he moved to Wad El Haddad in the south of El Gezira. They also pointed to the cancellation of Al Bashir's scheduled visits to Rufaa and Kamlin in the state. Witnesses pointed to the arrival of a large number of armoured army vehicles with heavy weapons in an unprecedented manner. Residents pointed out to banning basic school pupils to leave schools in anticipation of the outbreak of demonstrations, while there was no bread in schools on Tuesday.